Tonight (Sat. 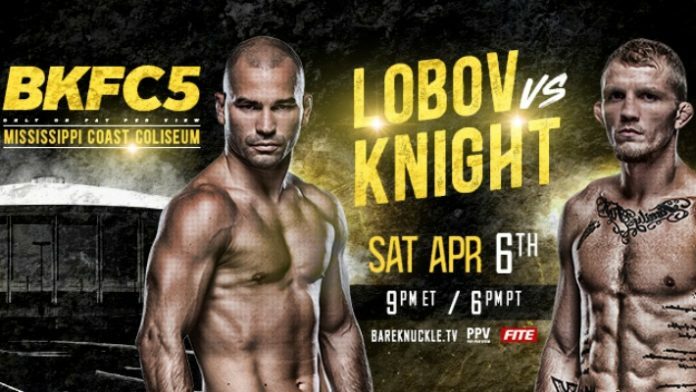 April 6, 2019) Bare Knuckle Fighting Championship (BKFC) 5 takes place from the Mississippi Coast Coliseum in Biloxi, Mississippi. In the main event, former UFC featherweights Artem Lobov and Jason Knight square off. Also on the card, Justin Baesman and Chris Leben meet in a light heavyweight contest. The card includes several other exciting match-ups, which get underway on the preliminary card and can be seen on Facebook Live and FITE-TV. Also, you can watch the prelims along with us in the video player above. You can watch the main card, beginning at 9:00 P.M. ET, on pay-per-view (PPV).